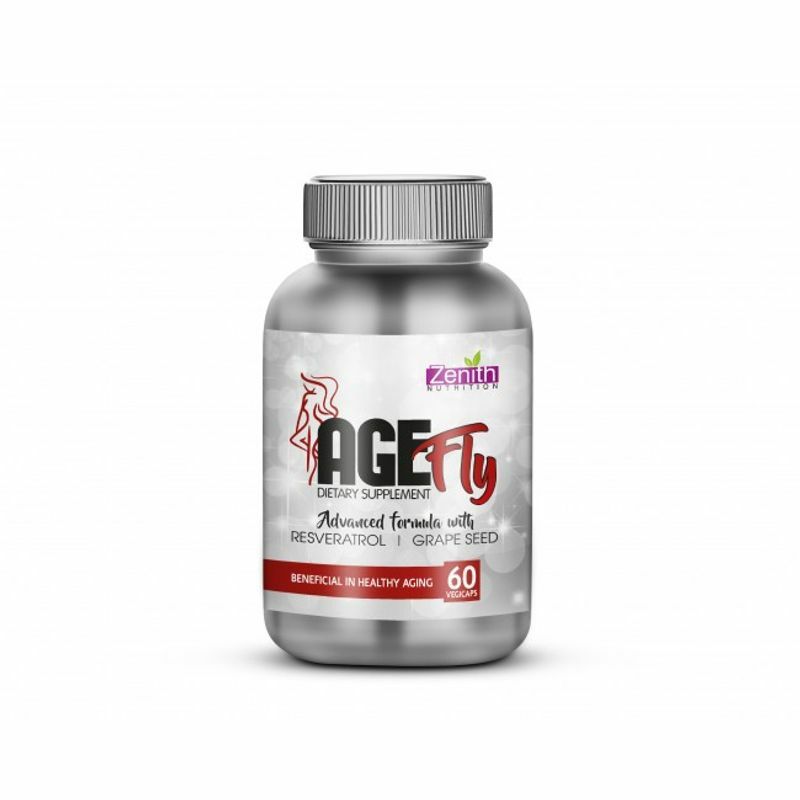 Stay looking young with Zenith Nutrition AgeFly. This advanced formula with anti-ageing Resveratrol can be used as a preventative measure, allowing you to retain your youthful appearance. It helps you to reduce blood pressure and promote weight loss leading to health benefits like a reduced risk of heart disease and other weight related problems like sore and swollen joints. It can help protect your brain and nervous system and protect your cells from free radical damage. Contains 200 mg of Grape seed extract in each vegetarian capsule. Polyphenols in it are flavonoids known for their high-antioxidant activity, helping protect the body against oxidative stress and free radical damage. Rich in antioxidant, antiallergenic, antihistamine, anti-inflammatory and immune boosting properties. Enriched with the goodness of natural Resveratrol and Grape seed extracts. Richest source of Oligomeric Proanthocyanidins (OPC's), one of the most powerful antioxidants. Protects the body's cells from the process of oxidation. 100% vegetarian dietary supplement with anti-oxidant benefits. Contains no preservatives, gelatin, wheat, animal by-products or starch. Dicalcium phosphate safe and gluten-free capsules. Explore the entire range of Weight Loss available on Nykaa. Shop more Zenith Nutrition products here.You can browse through the complete world of Zenith Nutrition Weight Loss .